REMAX Ocean Forest - Barton “Barry” Thigpen, Jr. In January, 1994, Barton "Barry" Thigpen Jr. left Leonard Call & Associates after ten years as one of their top listing and sales agents to form RE/MAX Ocean Forest. As a selling and listing broker, he has received the following awards: 100% Club, Platinum Club and Hall of Fame. A native South Carolinian, he is a United States Navy veteran of the Vietnam War, a graduate of Elon University and is active in numerous community activities. 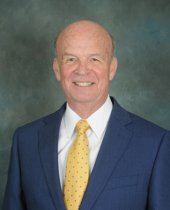 He is a 38 year member of the Myrtle Beach Rotary Club and a former Horry County School Board member and Myrtle Beach Area Chamber of Commerce President. He is also the Chairman of the National Shag Dance Championships which he founded in 1984. In managing real estate, family and life, he follows the philosophy of the Rotary Four Way test: Is it the truth? Is it fair to all concerned? Will it build goodwill and better friendships? Will it be beneficial to all concerned?